We have trained and hunted retrievers since 1980. Waterfowl are my favorite, and nothing is finer than having a retrieving buddy to share it with. No two dogs are alike, so we tailor my program to fit each dog as an individual. You tell us what you'd like to see in your gundog and we will personalize the program to fit your needs. Our goal is to help create companions that you can be proud to take anywhere. Fully obedience trained: sit, stay here, heel, down, place, here whistle etc. Force Fetched... We force fetch lightly with a lot of praise thrown in. E-Collar Conditioned: We collar condition lightly. Our goal is a bold happy dog. For the non-hunter, or for non-retrieving breeds we have a 6-8 week program for basic obedience. It covers Sit, Stay, Here, Heel, Down, and Kennel, place to a dog bed, sit and wait at an exterior door before they are released with ok. When the puppy is ready, the owner is required to spend a few hours training with us for a graduation. If you want your retriever to learn to quarter and flush that can be arranged as well. With a 5 month season on shooting preserves, having your retriever trained to quarter and flush is something to consider. We have quality bird pens and will train your dog on live flushing pigeons, chucker, and pheasant. The upland program would last 3-4 months by itself or a few extra months when included with waterfowl training. Marty has trained several labs for me and I could not be happier with the quality of his work. We hunt our dogs almost daily in various habitats and Marty makes sure that they can handle whatever is thrown at them. 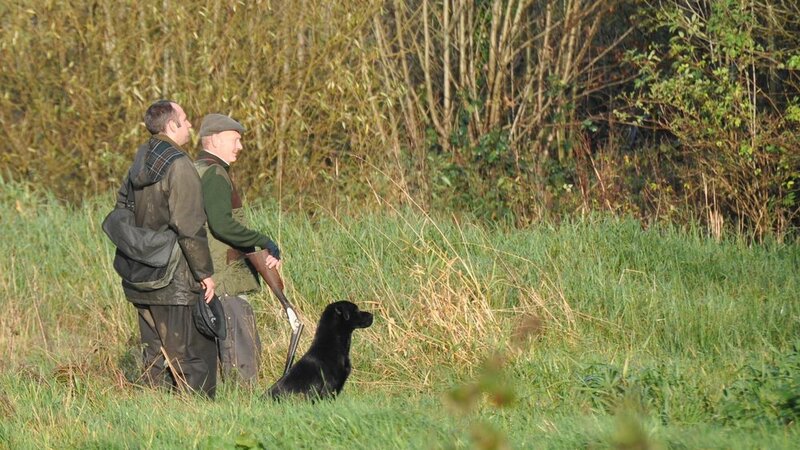 They add a great deal of enjoyment to our hunts for our guests. I would say that our guests enjoy watching a well-trained and energetic lab almost as much as watching a flock of mallards dropping through the trees. 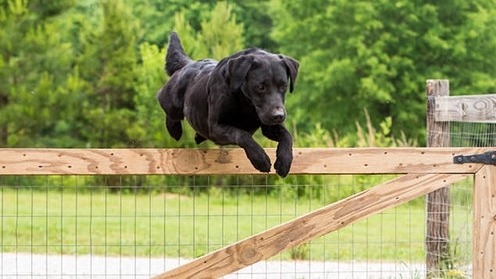 I highly recommend Marty Roberts and Sporting Life Kennels to anyone that is looking for a well trained and even-tempered lab that can be enjoyed by the whole family all year long. Marty Roberts and his staff at Sporting Life Kennels have done an outstanding job in training Ruby for the past 2 years. She earned her HR title this spring with me handling her, and she did it without failing any tests. Marty is currently training her for her HRCH title that we hope to earn this fall. She has proven to be a joy to duck hunt with as her discipline and handling skills are superb, thanks to Marty and his staff. Ready to Purchase a Trained Dog? Our started dogs are basic trained dogs, 10-14 months old and will have had some form of training since about 8 weeks of age. They are introduced to long walks through fields and bogs, taught to retrieve wings from early on and are introduced to water in the "Puppy Pond," a special pond made to be no more than 6 inches deep. Our goal is to imprint the sights, smells and feeling of what his or her purpose in life will be. We also believe in socialization - big time. From the time they are born, they have human interaction daily. It makes a tremendous difference. After 8 weeks, they are introduced to our puppy training yard. They learn to follow the handler up and down ramps, kenneling into field blinds, hopping into a johnboat on land where it's nice and stable, as well as over jumps. We have them follow us into a real duck blind. We do this with treat training, so it is all positive and rewarding, and the puppy thinks all of these exercises are fun. We follow this method, as well as throwing lots of marks and introducing them to swimming water as they grow. After all, most will be waterfowl dogs, and we want that love of water to help propel them forward when it's cold, icy and demanding. We start formalizing training in the 5-6 month range, depending on the individual puppy. This training brings all of the puppy training together, and from there, they move on to formalized field work. When we think the puppy is ready to go to his or her new home, we will expect them to be steady to shot; doing multiple retrieves; love a shotgun; picking up live and dead game; working from a duck blind; working from a platform like Avery Rough stand; starting to honor another dog and working from a boat. They should also know sit, stay, heel, here, down, place, kennel, "wait" to exit a doorway and "okay" to release. In short, the puppy is ready for their first season and will be an easy companion at home. At Sporting Life, we feel a dog isn't truly finished until not only has it had all of the foundation and advanced training necessary, but that it has had at least one or more good seasons in the field. Therefore, what some would call a Finished Dog for sale, we will call a "Seasoned Dog" for sale. This means that the dog has had most of the foundation and advanced training it needs to be a successful gundog, however it now needs to truly be hunted in order to be called finished. We do sell "Seasoned Dogs" throughout the year. Most are sold either as a puppy or as a started dog, and then stay on until it goes through "Handling Training". Most of these dogs are going to be 14-20 months of age. If you are interested in a "Seasoned Dog" fill out the form above. If you are interested in having an imported finished Labrador from either the United Kingdom or Ireland we have contacts and can begin a search for you. These dogs will typically be 3 to 4 years old and would have picked up during the shooting season for at least two seasons. They can be incredible gundogs and family companions. If you would like more information on purchasing an imported finished Labrador please fill out the form above. We have 2 yellow male pups that were born July (2018) and will be ready Summer of 2019. These pups are out of Rain x Mont. We are excited to see what these pups bring to the table. For more information, please contact us at sportinglifekennels@gmail.com or give us a call at 662-832-7551. Marty Roberts is a Southern Gentleman. his depth of character is reflected in the quality of the dog I purchased from him. His training engendered a dog that is gentle, sensitive, obedient, and a pleasure to be with. Yet Marty's gun dog training is trans-formational. Will, the dog I purchased from him, becomes energetic, focused, and driven when the whistle or bumper comes out. It's as if he has the internal switch that goes off when it is time to work. Will really has two personalities - and easy to be with, comfortable pal, and a hard-working, obedient servant. I highly recommend buying one of Marty's dogs. We bought Cane as a puppy from Sporting life kennels and then sent him back to be trained. Cane is now 2 1/2 years old. Choosing a new puppy was quite a process for the family. I like to hunt and have owned labs for years, but the family wanted a pet more than a retriever. We bought Cane from Marty with the hope that he might live up the hype of the British lab and be good at both. Little did I know just how unique he would be. As a family dog, he has no equal. He is energetic, funny, happy and loving. He learns faster than any dog I have ever known. This is one very smart, very special dog. A new best friend in the cab of your truck.